Playing with Papercrafting: Just a Minion, Happy Birthday! I just recently held a Birthday Stamper's Dozen class where my customers create twelve cards, three each of four designs. I like to have a variety of card types at my classes, including some for children, but I wanted a child's design that would be good for both genders and a large age range. With some help from several designs that I saw on Pinterest, I designed a Minion card. 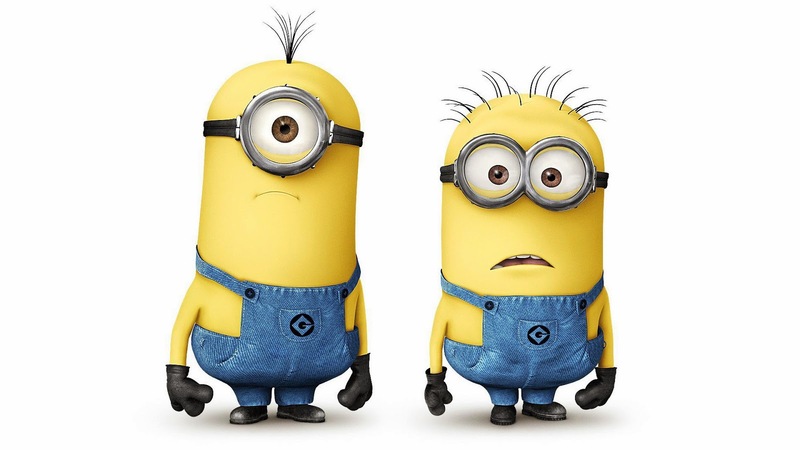 For those who don't know, the minions are the little yellow creatures that work for the main character Gru on the Despicable Me movies. I used a 2 1/2" wide piece of Daffodil Delight cardstock for the minion's body and rounded the top by inserting the cardstock through one of the circle framelits and under the top cutting edge, then running it through the Big Shot only halfway then out again. I did this to avoid the embossed line from the bottom of the framelit on my minion's body. I used the Circle Framelits again to make his goggles (or are goggles for a one-eyed creature just goggle?) I positioned the second and third smallest framelits with the smaller one centered inside the larger one on a scrap piece of Basic Gray cardstock and ran that through the Big Shot. The eye was created using a series of colours and punches: Whisper White with the 1" Circle Punch, Pool Party with the 3/4" Circle Punch and Basic Black with the 1/2" Circle Punch. A rectangular piece of Night of Navy cardstock creates the bib of his overalls with 1/4" wide strips for the straps. 1/4" strips of Basic Black form the band of the goggles. To make the mouth, you punch out a 1" circle from Basic Black, then punch the edge of the hole again with the 1" punch to get a sliver of black. The hair is just hand cut slivers of black glued to the back of his head. The sentiment, stamped in Night of Navy is from Bring on the Cake, a great birthday greeting set! A couple of designer buttons on the overalls finish the look. We all agreed that the Minion card would work not only for kids but for some adults as well. Have fun and give it a try. Add your own touch to it. And if you haven't watched Despicable Me yet, you'll enjoy it! Would one lens be called a monocle? Regardless, they turned out pretty cute. Go for it, Linny! I don't mind at all!